The bull market continued on its way during December with the S&P 500 gaining 0.98% for the month. While I'd prefer to see lower prices if I was buying, I can't say my net worth is disappointed with this bull run in the least. Fortunately for me we're at a point where valuations are high and investment opportunities are hard to come by right when we're trying to pay down debt. During December my net worth increased $10,666.86. 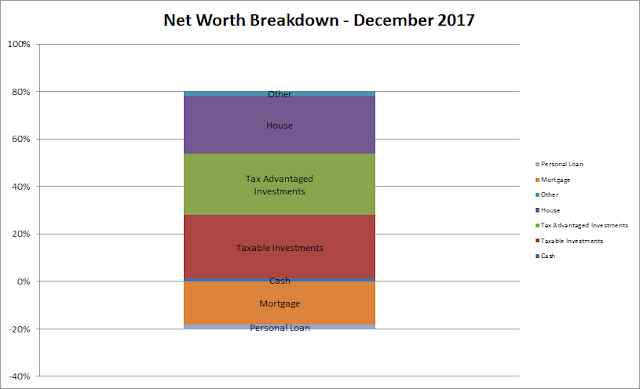 My net worth increased 2.0% during December and has climbed 13.7% YTD. What's fun to see is that December marked 11 straight months of net worth gains which is my longest streak since June 2012 through December 2013. While it's great to see the net worth over $500k and assets over $700k, the thing I'm most excited about is that we're back to being cash flow positive by a few grand each month. That extra cash flow will be aimed at the bit of debt that we have to free up our income to go towards savings and investing instead of towards debt. We'll likely be a bit conservative with our debt pay down for the next month or two in order to get a bit of a cash buffer, but after that it'll be full steam ahead. At this time I don't see much reason to pay extra on the mortgage given our relatively low interest rate as well as the tax break on mortgage payments and think we'll come out much further ahead investing the extra cash flow. Actually I'm considering trying to do a refi sometime after Q1 is over. So the liabilities side of the net worth equation will be slow moving. However, once the FI portfolio is able to get to a self-sustaining level of dividends then the plan is to aggressively pay down the mortgage. 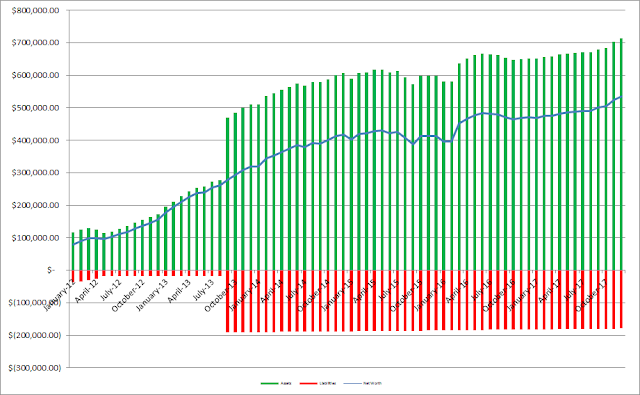 As of the end of December we have 25.7% equity in our house based on our purchase price from 2013. However, according to Zillow our house has increased in value just over $35.6k from our purchase price which is a nice bonus, although I keep the purchase price as the value in the net worth equations. Based on Zillow's estimate the equity in our house is 36.1% thanks to the appreciation. Since I write so much about investigating companies as an investment I figured it'd be fun to see how our balance sheet looks. As of the end of December our debt to equity ratio is 34% and our debt to total capitalization is 20%. Not bad, but I'd love to get that debt down to ZERO! Truly passive income, dividends and interest, totaled $910.35 during December which was about a $4 increase from September. *Dividends are from my taxable accounts only. With my writing taking a back seat the past few months the EBIT from blogging/writing has been fairly negligible the past few months. However, December did see $72.42 of EBIT which pushed the total non-day job income for December up to $982.77. For all of 2017 I had a total of 7,111.96 worth of income outside of a traditional day job. Good recap and congrats on the continued progress. 11 months of straight net worth increase is impressive. Glad you enjoyed it. 11 months is pretty cool to see of course the markets really helped out on that front, but I'll take it however I can. 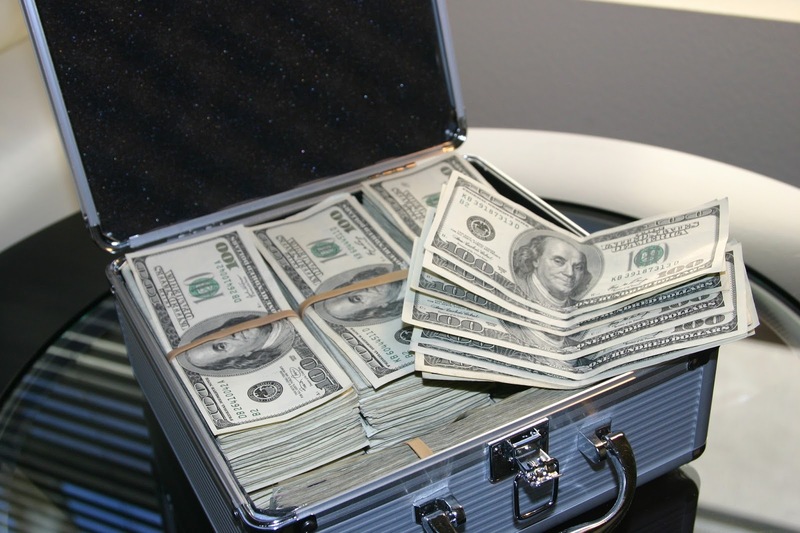 I consider my non-day job income as anything that I earn cash from that isn't my day job. So dividends, interest, writing/blogging all gets lumped into that category. Dividends are by far the biggest source on non-day job income, but the blog does churn out a bit each month. I'm hoping to get back in a a better routine with writing because I would also like to start writing on Seeking Alpha again which brings in more exposure and more income than my little blog. Great progress to end the year, JC. Congrats on ending the year strong and noting a 13.7% increase in net worth for 2017. We had a fantastic year too networth-wise. ps: Cool new theme...Ive been considering switching up the theme on my blog too. Those back to back +$10k moves sure did help out for the end of year total. And I was pretty happy to see a 13.7% increase for the year considering we weren't able to ride the markets higher with fresh capital and we were still kind of blah as far as cash flow for the first half of 2017. I'm glad you like the theme. I'm still undecided about the black background/white text, overall I like that look but sometimes I feel it's hard to read. So I might make a few tweaks to it, but it was very much needed because the theme before was very outdated. You have an impressive portfolio.